5 Best Haunted Attractions in the U.S. According to the Haunted Attraction Association (HAA), haunted attractions such as zombie hayrides and corn mazes, theme park horror nights, and temporary haunted houses have become a $6 billion industry. For many Americans, visiting these frightening attractions has become a tradition. If you want to jump on terror train, check out this list of the some of the best haunted attractions in America. We picked one stand out attraction in each area of the U.S.
Every October the Nashoba Valley Ski Area transforms into Witch’s Woods where visitors can board the Haunted Hayride that travels deep into a forest filled with ghosts, zombies, and the spirits of dead lumberjacks. Visitors can also take a medieval journey through Castle Morbid, wander among the secret passages of Nightmare Mansion, enter a new dimension of terror in The Keeper’s Crypt, and see hundreds of professionally carved pumpkins in the Jack O’Lantern Jamboree. Terror Behind the Walls at Eastern State Penitentiary, Philadelphia, PA. This massive haunted house features six attractions located inside a real, 11-acre abandoned prison. Walk around cellblocks in pitch black to the Machine Shop, The Experiment, Night Watch, Lock Down, Infirmary, and Detritus. Celebrating 22 years of existence, Terror Behind the Walls offers a true interactive experience for those who want it. Best of all? Many people believe that the prison is really haunted. View this video for a preview of what you might expect. Terror Behind the Walls 2014 from Terror Behind the Walls on Vimeo. Affectionately known as Cincinnati’s scariest haunted house, The Dent Schoolhouse was an actual public school. It was opened in 1894 and is said to be really haunted by Charlie a mangled-faced janitor who, according to legend, killed some Dent children in the 1950s in response to their taunts. The children’s remains were supposedly found within the walls of the school’s basement. This year, Haunted Attraction Magazine selected The House of Shock as the #1 Haunted House in the country. And this is the year to experience it because after 20 years, The House of Shock will be closing. The 2014 Halloween season will be its last. Located in a massive converted warehouse, The House of Shock features a labyrinth of horror swarming with ghouls. But it’s much more than just a true haunted house; The House of Shock is a heavy metal, pseudo-satanic themed Halloween festival with live music, amazing pyrotechnics, food, and a full bar. For more information or to purchase tickets, visit The House of Shock website. With so many over-the-top attractions in Las Vegas, it might be hard to stand out but The Asylum & Hotel Fear attraction does just that. Both attractions tell the story about Mortimer Feoray, a child who grew up to be a madman. Mortimer was the grandson of the Hotel Feoray’s founder. After killing everyone in the hotel, he ended up in the Asylum. At the Asylum, visitors take a walk through a creepy two-story sanitarium of horror. The crazy patients that live in the insane asylum terrorize visitors as they pass the admitting area, nurses’ station, therapy room, patients’ rooms, and the morgue. At Hotel Fear, visitors walk into a hotel lobby and are sent through a maze of corridors to find Mortimer in Room 13. 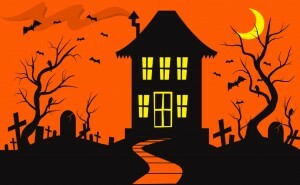 If you can’t make it to one of the above attractions, visit HauntedHouse.com for a huge listing of haunted houses around the country. Find some frightening fun in your local area.